Experience the essence of beachfront relaxation at HOTEL LUCIA BEACH, a family- friendly hotel near San Juan offering comfortable accommodations and affordable all inclusive packages in southeast Puerto Rico. Our inn is ideal for family travel, group trips, honeymoons or a variety of other seaside events. Enjoy the comforts of home in any of our 26 cozy guestrooms, each offering amenities such as satellite TV, air conditioning, a small refrigerator, microwave oven, coffee maker and a private bathroom. Next door at Parador Palmas de Lucía you can enjoy our facilities of: guest laundry, and an elite restaurant serving fresh local favorites, seafood standards and vegetarian specialties. Our recreation options at Parador Palmas de Lucía are unmatched by Puerto Rico inns, from our pool, basketball and volleyball courts, hammocks area. Our hotel is located in a prime spot, just feet from gorgeous Lucía Beach and the blue waters of the Caribbean Sea. From our location just a short distance from Yabucoa, you can easily explore inland attractions or head out to Vieques Island, home of the beautiful Bioluminescent Bay. A trip toward the heart of the island reveals pristine tracts of trees and opportunities for inland adventure at El Yunque National Forest, along with the renowned historical buildings of Yabucoa. No matter your motivation for visiting Puerto Rico, or the size or makeup of your party, Hotel Lucía Beach is an ideal destination for relaxing travel to the Caribbean. Our tropical inn is family-friendly yet hip, affordable but exciting and environmentally friendly despite its full slate of amenities. Stay in one of our Hotel Lucía Beach hotel rooms and discover complete and utter relaxation at an affordable price. Each of our 26 Caribbean rooms is outfitted with plentiful amenities unmatched by other Puerto Rico hotels. 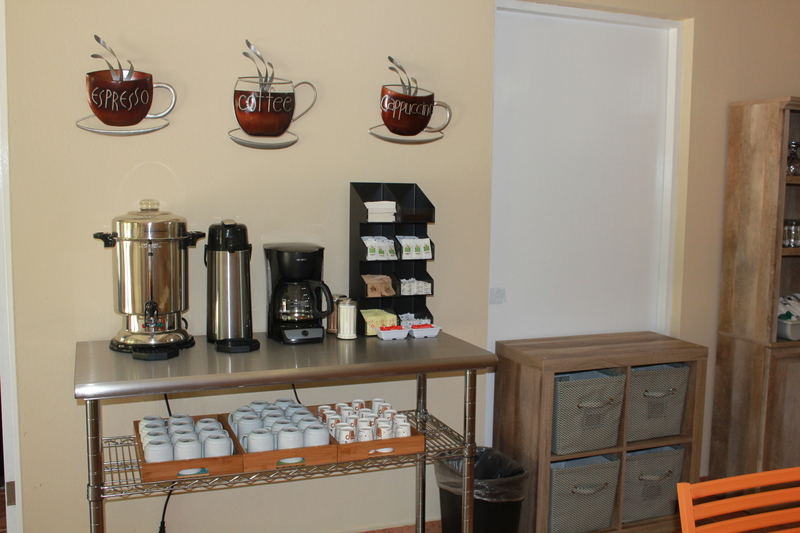 The Hotel Lucia Beach has a dining room very welcoming for the service of the breakfasts. We offer our guests the restaurant of the Parador Palmas de Lucía located next to the Hotel Lucia Beach. The Palmas de Lucía Restaurant has a full menu of fresh local specialties and seafood and a lounge with seating for 60 people and an outdoor terrace for 20 people where our guests consume the foods of the All Inclusive Family Offer. In addition, Palmas de Lucía has a bar in front of its swimming pool for the enjoyment of our guests' favorite beverages at Hotel Lucía Beach. The All Inclusive Family Offer includes: American (full) breakfast, lunch with soda, snack with soda and coffee, dinner with soda and dessert, taxes and gratuities. 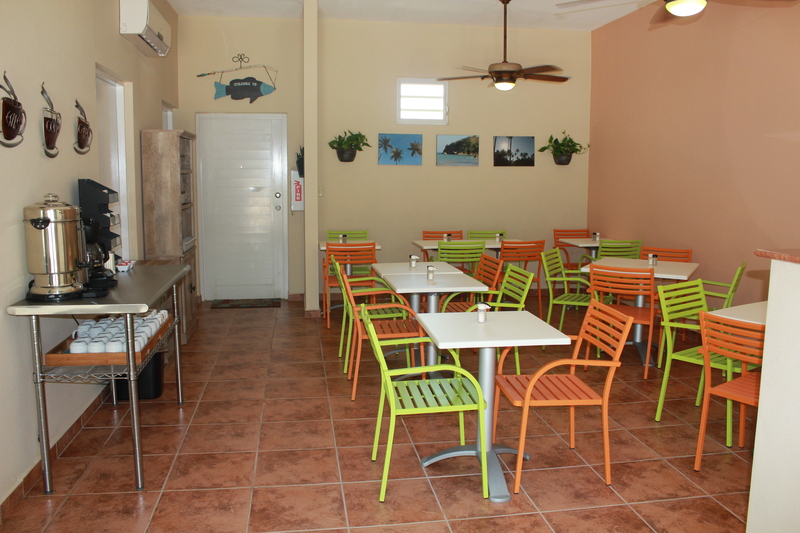 You do not need to go far when you are looking for a restaurant in Puerto Rico, as we serve all the colorful Caribbean flavors within walking distance of your hotel room. Next door at Parador Palmas de Lucia Our restaurant has a menu full of fresh local and seafood specialties and room for 80 diners (60 indoor and 20 outdoor). You won’t need to look far when seeking a restaurant in Puerto Rico, as we serve all the colorful flavors of the Caribbean just steps from your hotel room. If you select our All Inclusive Offer, you will have access to three meals and one snack each day, soft drinks during meals, and dessert included. If, as usual, the weather is pleasant, you can take your exercise outside to our basketball and volleyball courts to challenge family or friends to a quick game. After you break a sweat, take a dip in our refreshing Puerto Rico pool or relax in a hammock. You can journey to the beaches of the Caribbean without ever leaving the comforts of home behind when you stay at Hotel Lucía Beach. Keep current on your work tasks or just check your email with our high-speed Internet access, available in our dinnig area and recreational areas. Our hotel uses electronic lock systems on its rooms and main entrance, We also offer free parking for all guests. Gather your friends and family at the edge of the Caribbean for the celebration of your most special day. The perfect Puerto Rico beach wedding awaits you at Hote Lucía Beach, located just 100 feet from beautiful Lucía When you hold your beach wedding in Puerto Rico at our inn, you can expect the finest guest services, wedding planning assistance and dining options. At Parador Palmas de Lucia our restaurant can provide the food at your rehearsal dinner or reception, ensuring your guests will enjoy delicious favorites custom-cooked to your specifications. Our main dining room can handle up to 60 guests and our outdoor terrace can hold 20 revelers. Our experienced professional staff will help plan your event and arrange catering, making sure you will enjoy one of the top weddings Puerto Rico has to offer. We have plenty of space for your guests in our 24 immaculately outfitted guestrooms, furnished with either two double beds or one king bed. Business meets pleasure just steps from the Caribbean Sea at next door Parador Palmas de Lucía, an ideal destination for Puerto Rico conferences. 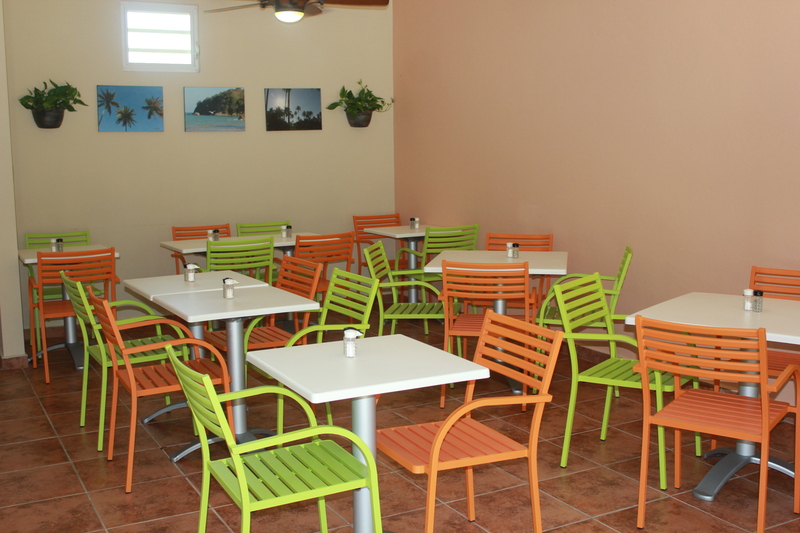 Our Puerto Rico business inn has ample space for meetings in its full-service restaurant, which seats 60 guests. Not only can you host a sizeable meeting in our modern banquet hall, your attendees can all stay connected to their respective offices by using our high-speed wireless Internet service, available in our meeting hall and recreation areas. When the day’s work is done, your business group will have plenty to do in their free time. Our pool, hammocks, basketball court, and of course, Lucía Beach, all provide welcome respite from work just steps away from the convenience of high-speed Internet access and delicious meals. Hotel Lucía Beach is an ideal venue for a Puerto Rico retreat because of our beachfront location near plenty of attractions and outdoor activities. Our array of leisure activities, combined with reasonable rates and abundant meeting space, make Tropical Inns the logical choice when choosing business lodging or booking group reservations. Taxi Fixed Rates fromSJU Airport to Hotel Lucia Beach: $95.00. For more information call (787) 969-3260.